Err, I mean, yay! Finally, a perfectly seasonal item from Trader Joe's that has nothing to do with anything even remotely resembling a pumpkin or any of its usual camaraderie of spices. It's about freakin' time. How are Trader Joe's Ghost Pepper Potato Chips "seasonal" you ask? Well - Halloween is just a few weeks away! And these are ghost peppers we're talkin' 'bout here, Willis. Although, as grammatically improper a statement it is, I don't believe in no ghosts. But ghost peppers? Listen: Anything that has potential to melt your face off as if you just peered at the Ark of the Covenant ought to be feared and respected. Although not the most capitally capsacin-incapacitated peppers out there...those suckers are hot! Beware! Crunchy. Very crunchy and crispy yet lighter and airier due to design - in some ways it was like eating a flattened sheet of potato sticks, which I say as a compliment. Great texture, great munch. Then the flavor started sinking in...smokey, a little mesquitey, a small hint of sweetness, a scant of burn - hey, wait a second here! I just described a pretty adequate barbecue chip. And honestly, that's what these supposedly spicy suckers tasted a lot like, except with a little tingle on the afterburn. 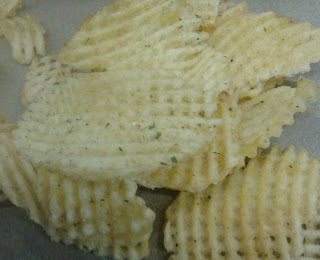 The spicy seemed to build a bit with each successive chip, but never to the point of unpleasantry. In some ways, after such a huge ramping up to get myself psyched, it was a big letdown. Not. Hot. But don't take my word for it. Take my toddler's, who's adventurous as a three year old can be when it comes to food, but shies away from most spicy stuff. She insisted on trying a chip, though, and with some hesitation, Sandy and I offered her one, milk cup and tear rags ready to go just in case. "Yummy!" she exclaimed. "I wike these." I asked if her if she thought they were spicy, and she said "No, maybe just a little bit." So, there you have it - another exotic sounding TJ chip which turned out to be more BBQy than truly unique. In some ways, I'm somewhat relieved of that - the munch factor was extremely high, so it was nice to not be inhibited by spice overload. But in others, I'm kinda disappointed - I wanted these pepper chips to have enough heat to scare me away a little, but be enough of a treat to keep me coming back for more. For $2.29, they're tough to argue with, though. Sandy enjoyed them enough to give them a four, mostly for texture and crunch (seriously, try eating just one or two - not gonna happen) which seems around right to me. A little more spooky spice would send them over the top, but their overall tastiness isn't an apparition. Hey, it took forever for this page to load... what is with the huge Dietz ad? as well as the other ads? btw did u see Guy's Grocery Games where they used Ghost Chips as their challenge ingredient? Reason I mention it is that the TJ's packaging was the same as the one they had on tv... tho the chips weren't the same color as what u show. Same here.Multiple videos trying to play and send sound through the speakers. The webpage jerks up and down because it is trying to load more ads. I'll have to just follow on FB and stop visiting the page. Took five attempts to comment this because of the page flipping on me due to the ads below. I'm not having any issues but the adds that are coming up are clearly based on my cookies. So issues may be related to the browsing history on the computer others are using. I was excited about these when I saw them. Asked if they had serious heat and they popped a bag open for me to try. Sweet. Waited for the heat. Never came. Did not purchase. I bought these and was terribly disappointed. No heat. What is wrong with you, Joe? If you put the words ghost pepper on the front of a package, people are going to buy it expecting heat. Definitely tasty - and good chips - but agree with everyone else that they just don't have the spice expected (or promised to my by the TJs employee that recommended them! ).